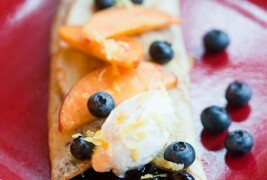 This is the perfect brunch dish, especially for blueberry fanatics like myself. Don’t worry about the technique of making crepes if you are new to it; you get the hang of it very quickly. Garnish with powdered sugar, shaken through a fine sieve.